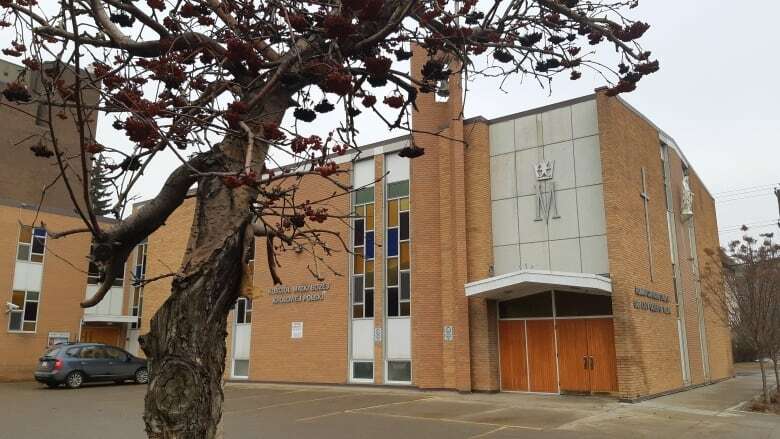 Police are investigating after Edmonton parishioners, armed with canes, protected their priest from an unprovoked assault. Edmonton police are investigating after a group of elderly women, armed with canes, protected their parish priest from an unprovoked assault. Father Marcin Mironiuk had just finished leading evening mass at Our Lady Queen of Poland Parish in south Edmonton on March 13 when he was approached by a young man he didn't recognize. Within seconds, the stranger threw Mironiuk to the ground and wrapped his hands tightly around Mironiuk's neck, said Lorraine Turchansky, a spokesperson for the Catholic Archdiocese of Edmonton. "They were elderly ladies who were very shocked, understandably, but they did manage to intervene," Turchansky said in an interview Tuesday with CBC Radio's Edmonton AM. "They hit him with their canes and got him to release the priest." The assailant loosened his grip on Mironiuk's neck and ran off, Turchansky said. "Perhaps if they had been younger they would have had their cell phones out and would have been calling 911 but that wasn't the case here," Turchansky said. Mironiuk, who declined an interview with CBC News, wasn't hurt in the attack. Edmonton police confirmed that an investigation is ongoing, and that witnesses, armed with canes, helped scare off the alleged attacker. Police described the suspect as a white man, five-foot-nine and about 25 years old. He had short dark hair and wore a red T-shirt and a black jacket. He smelled of liquor, police said. The church is at 9906 83rd Ave. in the Strathcona neighbourhood. Father Roger Rouleau, the pastor at Catholic Parish of the Holy Name in Vermilion, 190 kilometres east of Edmonton, experienced a similar scare on Sunday, March 24. Rouleau was in the middle of a morning mass when a man rushed the altar, Turchansky said. "He pushed him up on the altar, and in that case, Father Rouleau couldn't help but think about what happened in that horrific attack in Montreal at St. Joseph's Oratory," Turchansky said. "I think a lot of priests are wary of something like that when they hear something so terrible. "We don't think about the priest being vulnerable but of course they are." The non-fatal stabbing of a priest in Montreal last Friday has put some leaders in the religious community on edge. "The incidents that we've seen [in Alberta] are not at that level," Turchansky said. "In most cases it's been someone who has mental health or addiction issues." In the Vermilion incident, the man who rushed the altar was not trying to harm the pastor but had been struggling with addictions issues and was seeking comfort. "As it turns out, the fellow who was approaching Father Roger just wanted a hug."